When Sheffield Hallam University in the UK put out a call to businesses to send in advertising briefs in return for a free commercial, local firm SSB Solicitors decided to give it a go. According to website RollOnFriday, the firm requested a piece about the dangers of dying intestate, and were excited to see the final product. The media studies students who created the advertisement decided to have a bit of fun, Roman style. 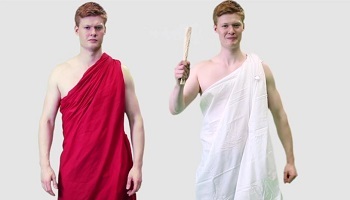 As you’ll see in the video embedded below, the ad features a young man in a toga waving a spatula around. In fact, said Roman was lucky enough to not just get one part in the commercial – but both of them. Apparently the students decided to upload their work of art well prior to its “unveiling” to SBB Solicitors (which presumably the firm thought would be an opportunity to check it was acceptable before it went live), gleefully describing it as a “viral advertisement”. Having watched the masterpiece no fewer than 11 times, RollOnFriday decided to call firm to see what they thought about it all. Partner Jeremy Brooke was surprised to learn that the piece was already online. He and his partners were all set to be watching it for the “first time” that afternoon. The lawyer watched the ad while the journalist waited on the line. After a sore silence, a defeated-sounding Brooke said: "What would you like me to say?"